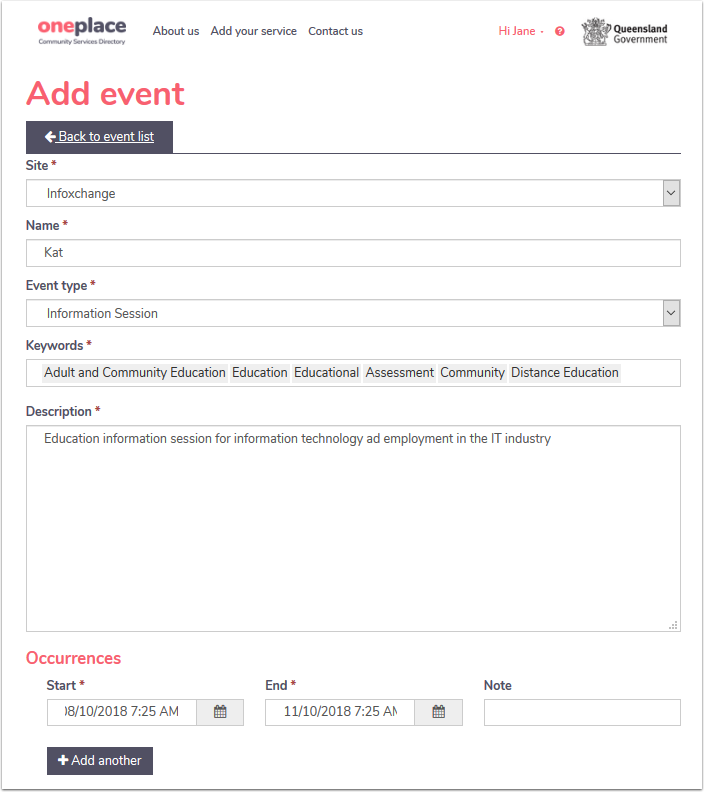 Logged in users of oneplace are able to Add Events for their organisation. Click on + Add event link at the top of the Manage events page. An Add event form will be displayed. Site - the organisation name or name of the site that the event will be held at. You will have the option to select from a drop down list. Event type - You will need to select the event type from a drop down list. Options include: community event, community meeting, conference, exhibit, fundraiser, information session, lecture, social/networking event, workshop, training and development and webinar. Keywords - You will need to select one or more keywords from a drop down list. Some of the types of keyword options include: Aboriginal, accommodation, anxiety, bullying, community, disability, youth, aged care, alcoholics anonymous, childcare, domestic assistance etc... You can select as many keywords as relevant to your event. Occurrences include start and end date of the event and any notes associated with it such as "bookings essential". You can add multiple occurrences of the event and remove them at any time. Address includes building/location name, Level, flat/unit number, street number, street name, street type, street suffix, suburb, postcode and state. The confidential address checkbox is automatically checked if your service is a confidential service. If the event being created is not for a confidential service, you still have the options to make the address confidential. 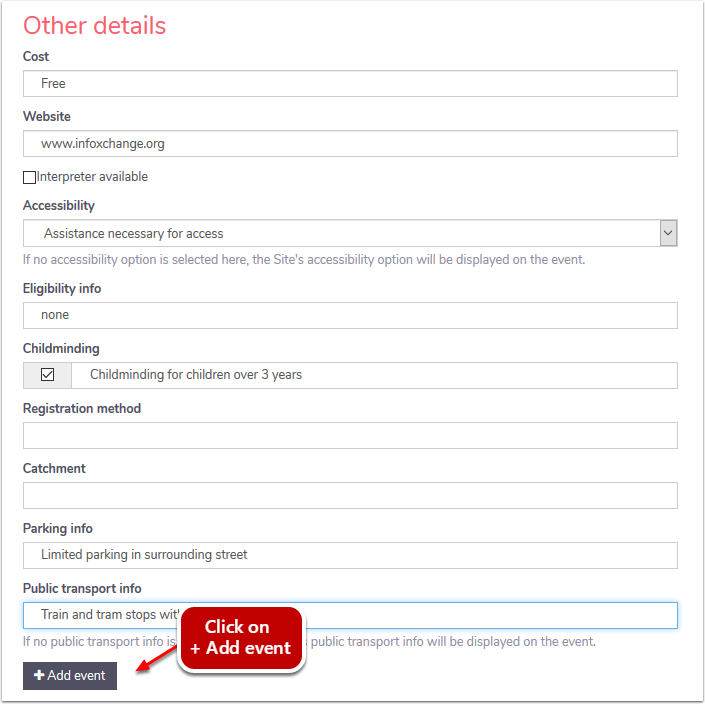 To prevent the address of an event being displayed in the event listing, tick the confidential Address checkbox. This will remove and disable all of the address fields accept for Suburb/Postcode/State and this will reflect in the Events search results. Once the form is complete, click on +Add event button at the bottom. Your upcoming events list will display. You can continue to add more events by simply clicking on + Add event link at the top of the Manage events page.